I have been making Christmas wreath chiffon cakes every year! 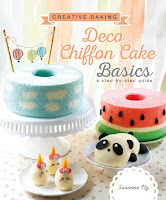 The Pandan bundt wreath is now in Deco Chiffon Cakes (my 2nd book). Last year I made a Rainbow bundt Christmas wreath. 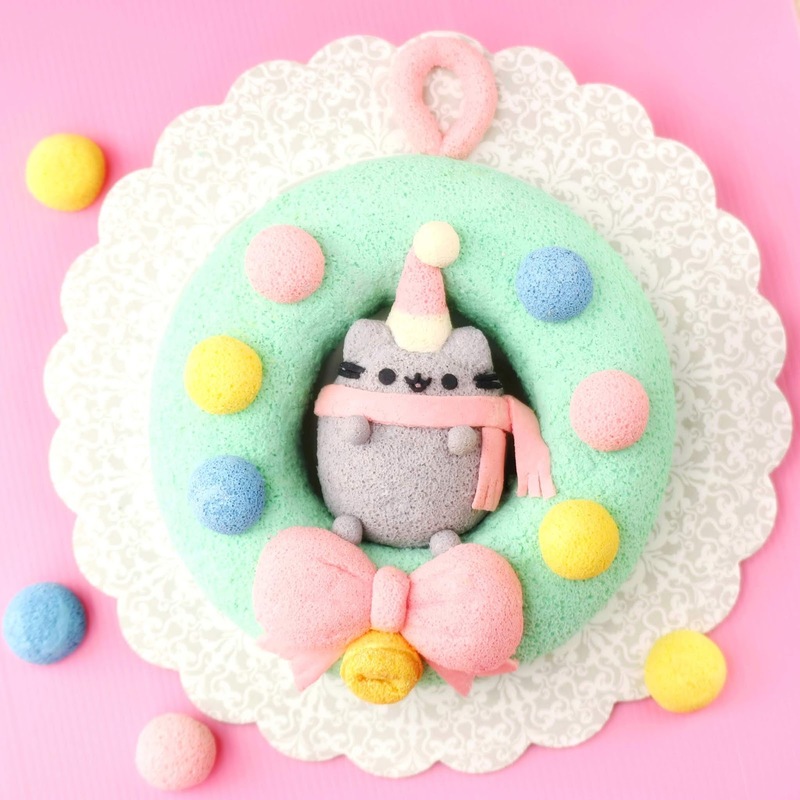 This year, it's a Pusheen Christmas wreath! 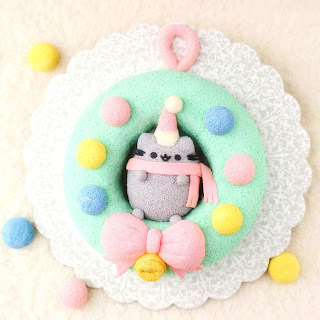 This creation is inspired by Pusheen's Christmas wreath plush =). Love at first sight for me! Really sorry for the break in posting too, been SUPER busy with my 3 kids now that it is school holidays. 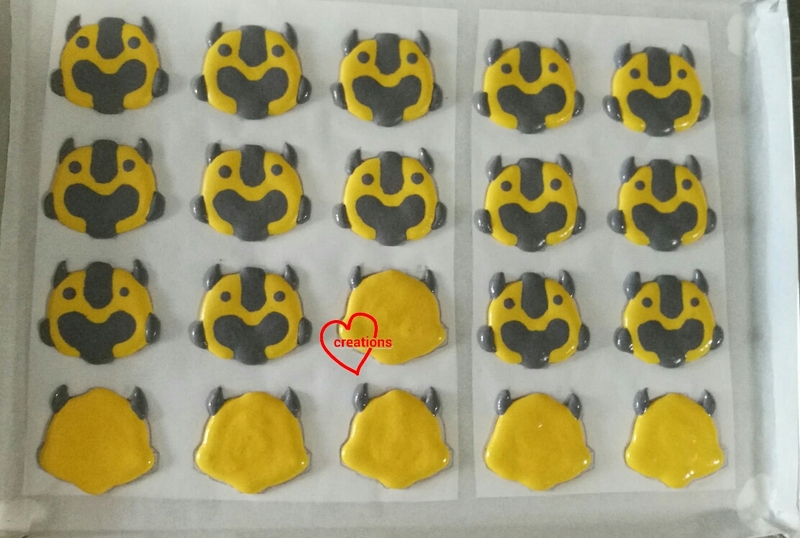 I don't have time to bake or write =p. Those with young kids will understand! I only have odd hours like this to write (its almost 11pm now!). Oh well, there are great joys in spending time with them too =). I never regretted becoming a stay-home-mum. <3 I hope all of you are having a great time with your kids too! I have written up the recipe below. 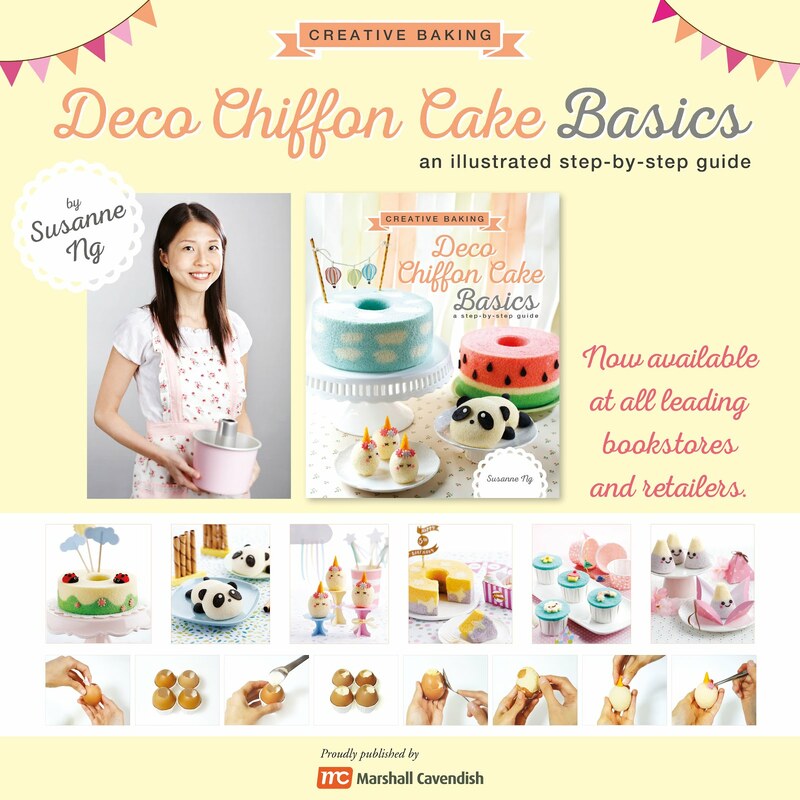 If you need picture references for the Pandan donut wreath, you can refer to the Pandan bundt wreath cake in Deco Chiffon Cakes. The concept is rather similar =). 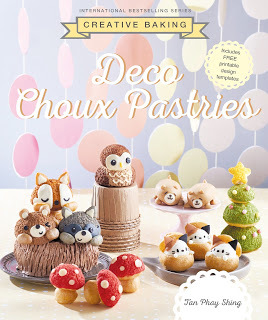 Also you can refer to the Video tutorial for Pusheen Chiffon Cake Pops here to visualize how I assembled the Pusheen. 1. Preheat oven to 140°. b. Add in oil, pandan juice, pandan paste and vanilla extract and mix well at each step. 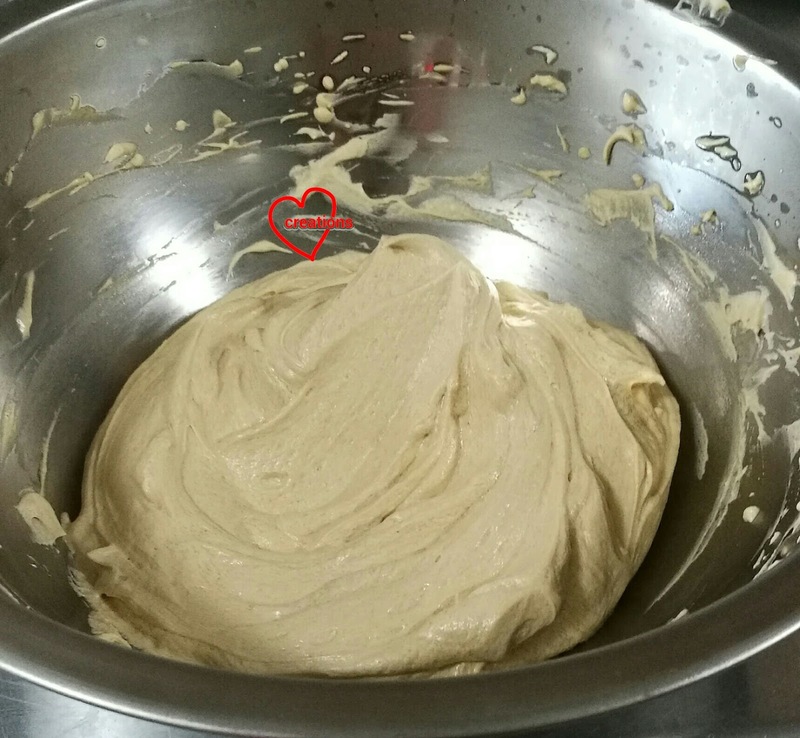 c. Whisk in sifted cake flour and salt and mix till no lumps are found. b. Add in castor sugar for meringue gradually and whisk at high speed till firm peaks form. 4. Portion out ¼ of meringue for pink batter. Gently fold in meringue into respective egg yolk batter 1/3 at a time. 5. Fill the silicone donut mold till 80% full. 6. Bake at 140°C for 40-45 min, or until skewer inserted into centre of cake comes out clean. 7. 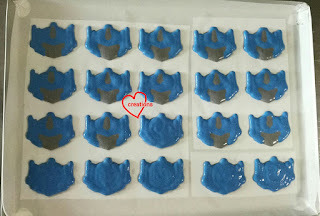 Allow the cake to cool completely on wire rack before unmolding by hand. The Pusheen chiffon pop is baked in a Jumbo XXL egg shell. *You can refer to video tutorial for Pegasus Pusheen Egg Chiffon Cake pops. This is similar in idea. The colourful balls are from silicone cake pop-molds. The hat is from baking pink batter in a paper cone. 1. Preheat oven to 140°. Prepare egg shell of a Jumbo Egg (XXL) for baking by making a hole at the long side, draining the insides and peeling off the membrane (see another Video tutorial). b. Add in oil, milk and vanilla extract and mix well at each step. 3. Spoon out 2 tsp into 2 bowls and add respective blue and yellow colouring for the ball cake pops (just a dip will do). Divide the rest of the batter into two. To one portion, add pink food coloring. To the other portion, add 2 pinches of charcoal powder (to get grey shade). 5. Portion out 4 tbsp meringue for each of the blue and yellow batter, 14 tbsp batter for the pink and grey batter respectively. Gently fold in meringue into respective egg yolk batter at a time. 6. Fill the Jumbo egg till 60% full and bake for 35 min, or until skewer comes out clean. 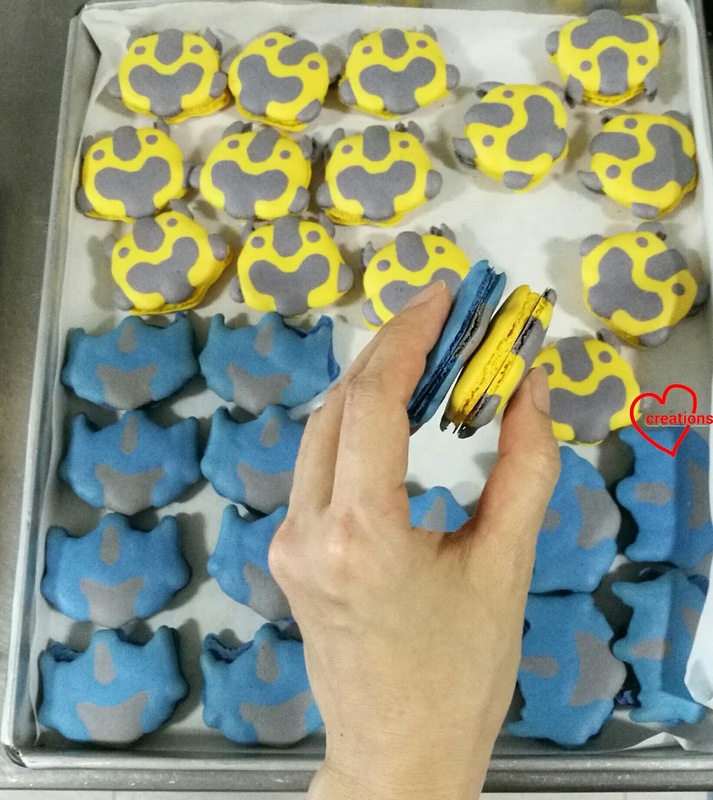 Bake the pink, blue and yellow in 2 cavities of 3-cm silicone donut mold for 18 min. Bake the leftover pink batter in a paper cone till 1-cm thick (for 15 min), 2 cavities of 5-cm silicone cake pop mold (for cutting out ribbon) (20 min), and lastly as sheet cake in a cupcake liner (for 18 min). *individual oven conditions may vary so do please check with skewer inserted into centre of cakes to see if it comes out totally dry. 7. 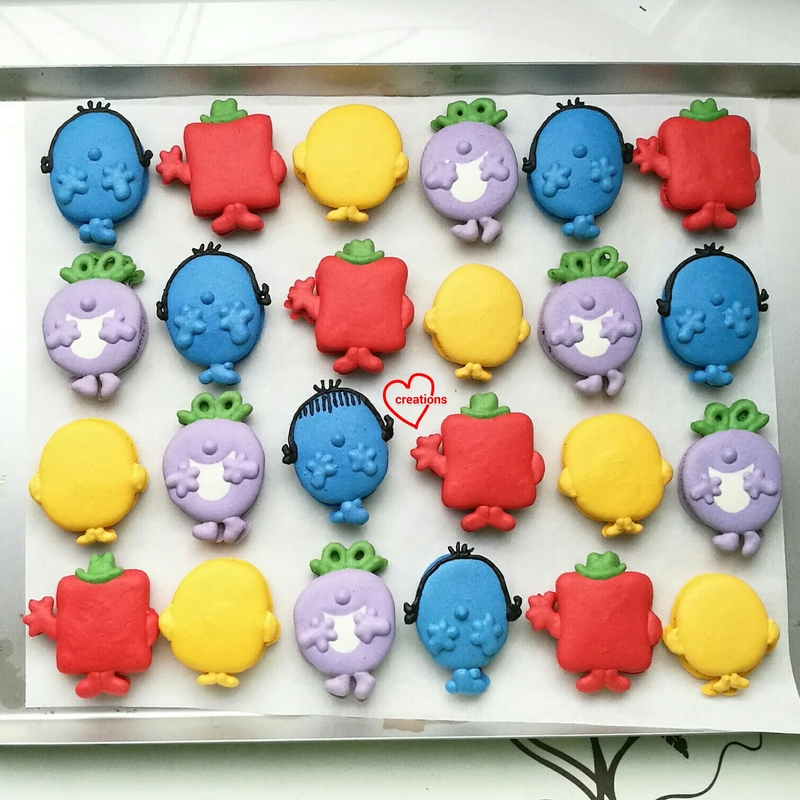 Allow the cakes to cool completely on wire rack before unmolding by hand. 8. 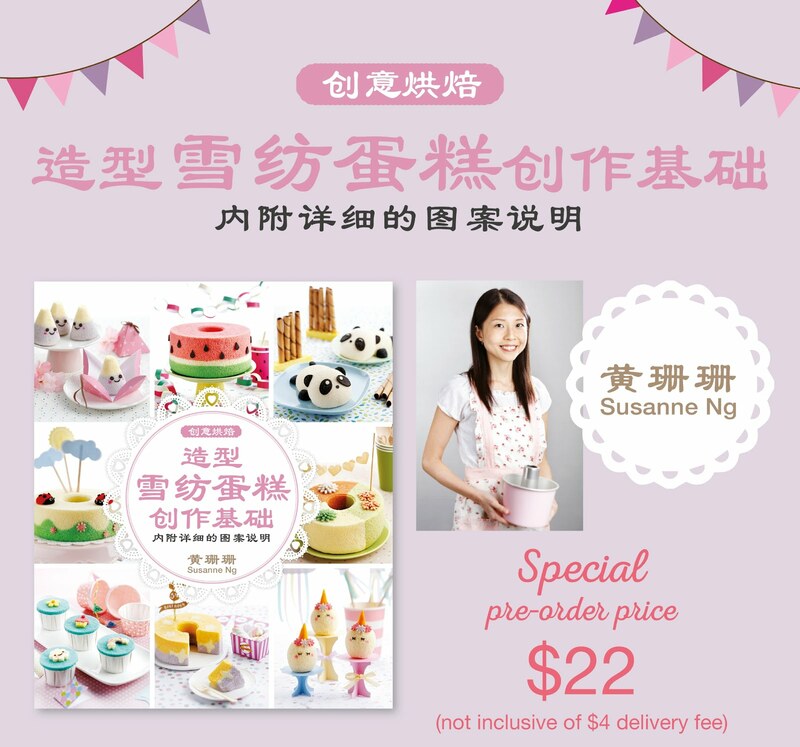 Unmould the Jumbo egg cake pop by cracking the egg shell into small pieces using the back of a teaspoon. 9. 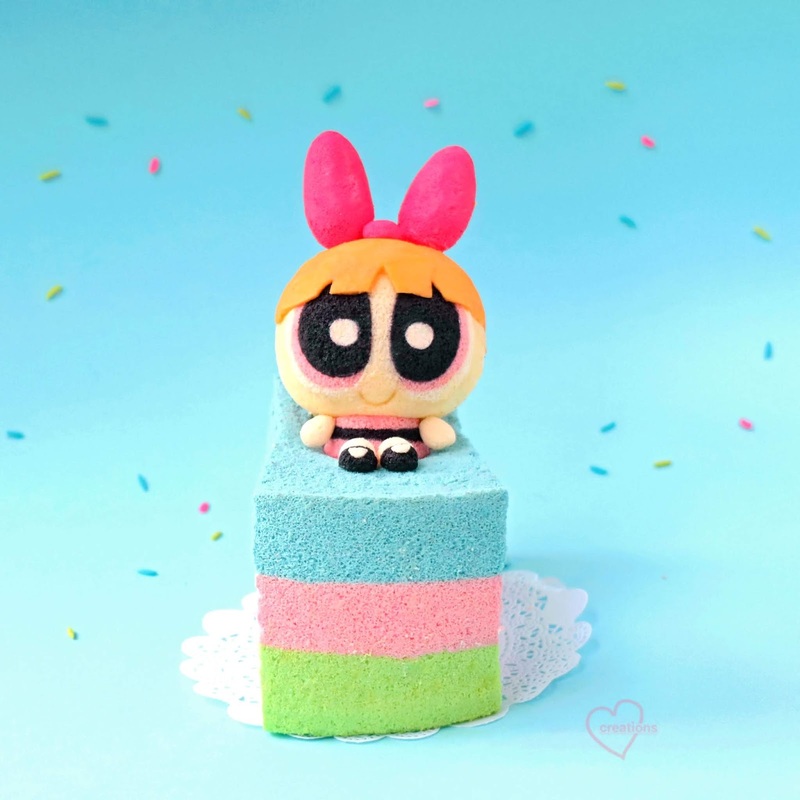 Assemble the Pusheen using melted marshmallow similar to Pegasus Pusheen Chiffon Cake pops. 10. Assemble the colourful cake pops onto the wreath cake using marshmallow cream. 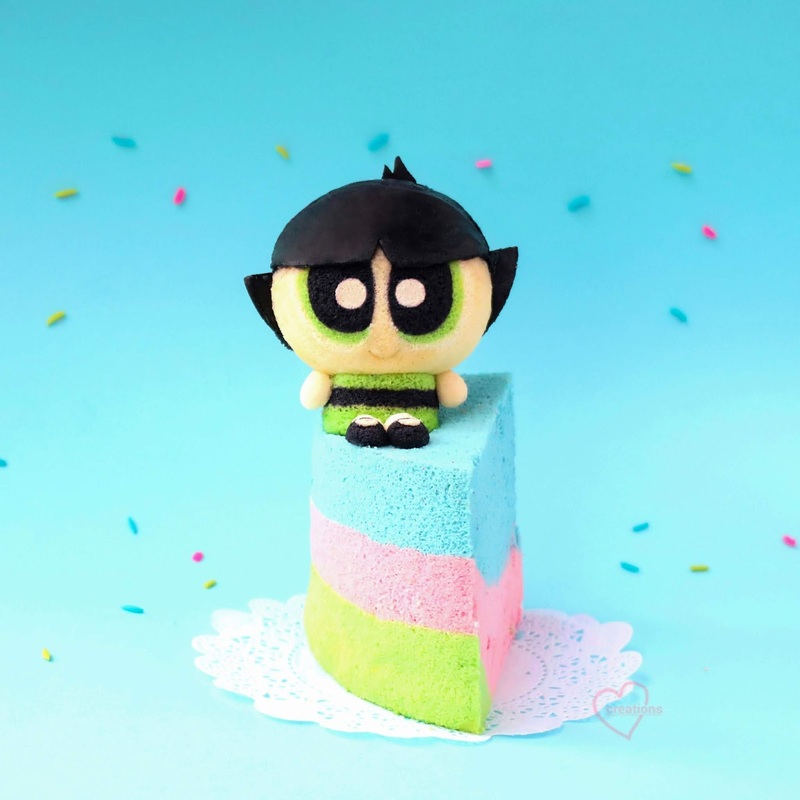 Cut the 5-cm cake pops into a shell shape, and cut out ribbons from the sheet cake and stick on likewise. I often get requests for unicorn macaron carousels. 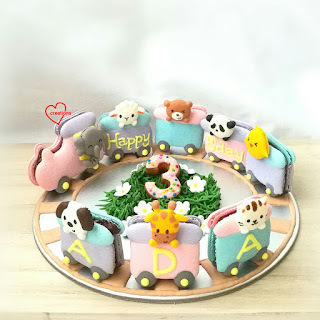 The next popular design and theme would have to be animal train macarons. I have made these quite a few times and didn't post some of them on the blog because it's more or less a repeat. 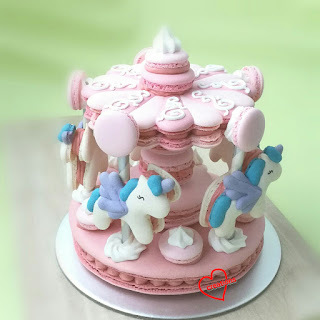 But this is the first time I am making it in girly pastels and using a new Swiss method recipe that many have been trying in the macaron Facebook group that I am in. It produces smooth and shiny surfaces and supposedly dries quite fast after piping the batter. I got really curious and decided to try. 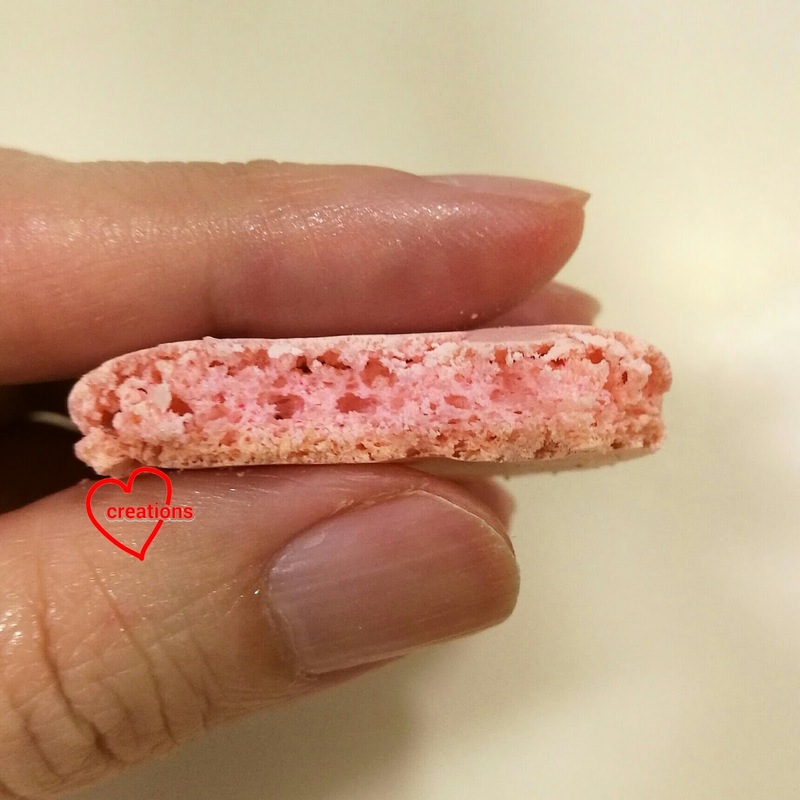 Many thanks to Audrey Goh for sharing her experience and recipe, and a few other ladies for sharing their experience with using this recipe 😘. I have learnt much and am enjoying the learning journey that never ends! Although I have made macarons using Swiss method quite a few times last year, I have never seen a recipe that recommends splitting the egg white portion for Swiss method. This is the usual practice for Italian meringue method that I usually use for large batches. I love having the egg whites split into two batches because there will be an almond paste (otherwise known as mass in the Italian method) which I can add colouring to Before the meringue is added in. This allows for colour adjustment to be made before meringue is added in, reducing the risk of overfolding should you need to adjust the shade of the colour along the way. I was really excited to try out this new method! Presenting my girly version of animal train macarons! 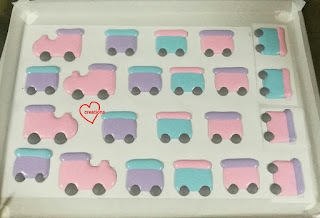 Sweet pastel animal train macarons filled with peppermint dark chocolate ganache! Pardon the poor photography as lighting nowadays is really poor. It's been raining everyday! Baked shells. See how tiny they are! 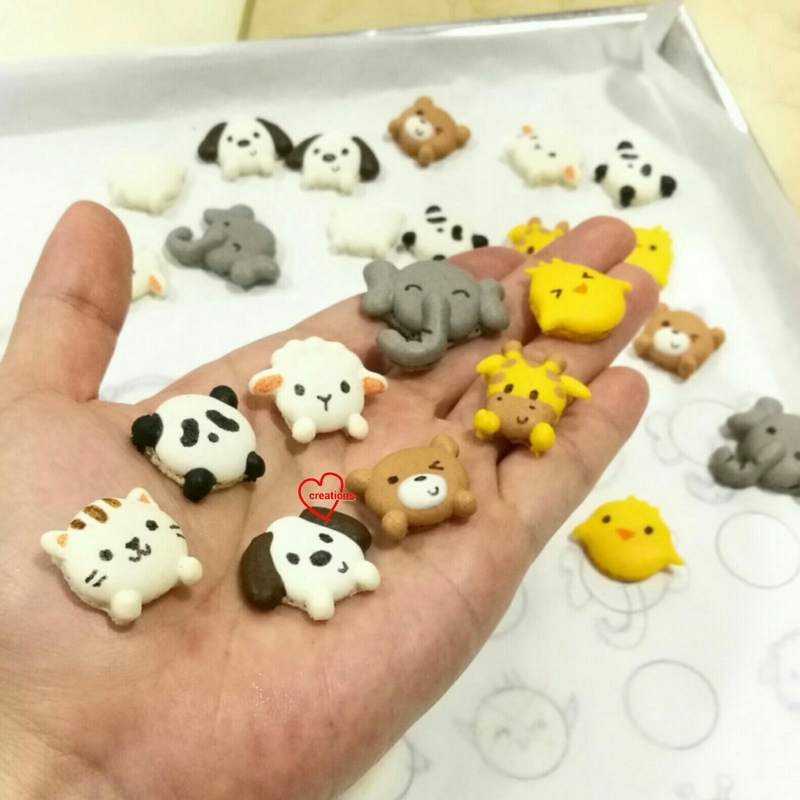 I can easily fit many of them on my hand! The facial features are added on using edible marker. The original recipe that Audrey shared had the egg white portion in ml. I converted into grams for your convenience. If you need to scale up the recipe, I suggest that you use the conversion ratio of 1ml egg white = 1.03g egg white. Aged egg whites are recommended although not absolutely necessary. I made the animal train locomotive and carriages concurrently with a unicorn carousel frame. Here's a picture of the carousel I made. Lighting that day was much better so I could take a better photo than the train macarons. See how smooth the surfaces are! 1. Prepare baking tray with template and parent paper. Set oven rack to lowest or second lowest position. The train template can be found in my Creative Baking: Macarons book. 2. 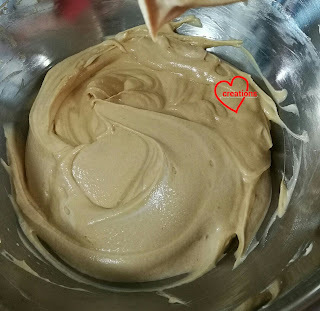 Make almond paste. Sift together almond and icing sugar. Add egg whites and mix well to form a thick paste. You may split this into various batches for colouring. Use gel food colouring. 3. Prepare Swiss meringue*. Place egg whites, cream of tartar (if using) and caster sugar into a heatproof bowl. Briefly whisk all ingredients together. Place the bowl over a simmering (not boiling) pot of water. Make sure the water does not touch base of bowl. 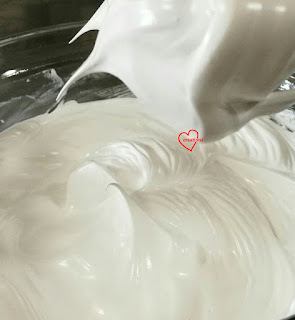 Whisk the egg whites and sugar until temperature reaches 45-50℃. All the sugar should dissolve and mixture should look white, opaque and smooth. This takes about 5-10 minutes. Make sure the temperature doesn't rise too fast or the sugar may not have time to dissolve completely. Once temperature is reached, immediately remove from heat and use an electric mixer to beat until firm peaks form. This takes about several minutes. Use medium speed to beat. Smooth, glossy Swiss meringue with firm peaks. 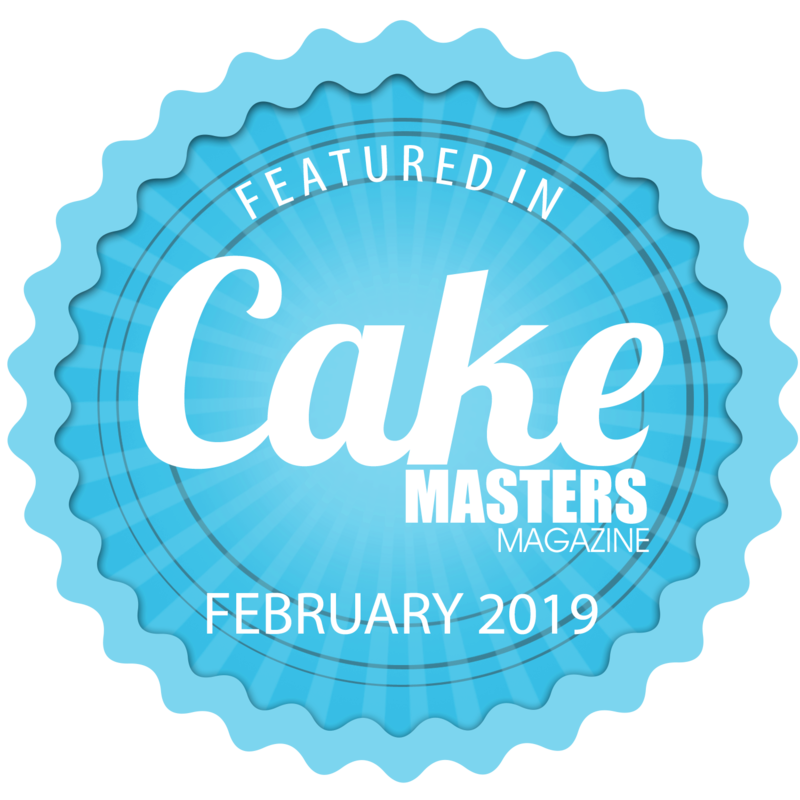 * Hannah, from the same macaron group, finds that keeping the egg whites as a single batch (75ml) and using all of it to make the Swiss meringue eliminates the problem of lopsided shells that she experienced when she uses this split egg white method. If you experience lopsided shells, you can try this method to see if it helps. 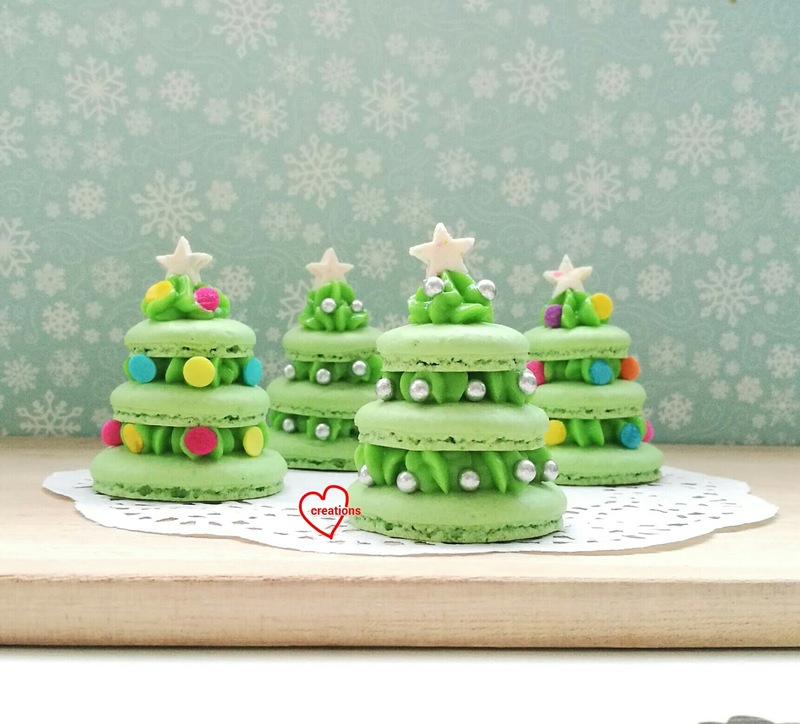 Basically you make the macaron shells like regular French method where dry ingredients are added into the meringue during macaronage, instead of a thick almond paste. 4. If you have split your almond paste into more than one batch for various colours, portion the meringue accordongly. Use the ratio of weight of meringue = 0.58 x weight of almond paste for each colour. Stick the corners of the parchment paper down with some meringue or macaron batter. 5. Fold meringue into almond paste in three additions. 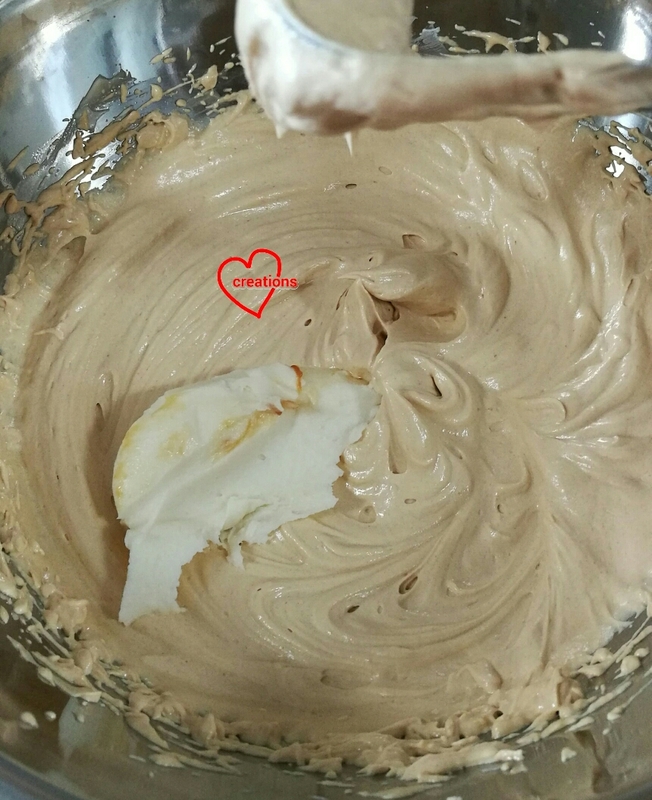 Make sure that the mixture is homogeneous before adding more meringue. Use the fold and press motion to incorporate the meringue. You may refer to this post for a video tutorial on how to fold the batter. Fold until batter is able to flow into continuous ribbon from the spatula. Transfer batter into piping bag and pipe the shells. 6. Rap the tray hard several times to release trapped air bubbles. Pop any stubborn air bubbles with toothpick. There shouldn't be many with this method. Dry the piped shells in air-con room or under a fan until a thin membrane forms. This shouldn't take too long but it depends on humidity. It took about half an hour to an hour for me in air-conditioned room. 7. Bake in preheated oven at 140℃ for 10 minutes followed by 110℃ for another 15-20 minutes until feet doesn't appear wet. Cool completely before removing parchment paper away from the shells. Note that baking time and temperature varies from oven to oven so use what is suitable for you. See how full and fluffy the insides are! I filled the shells with peppermint dark chocolate ganache. I used my regular dark chocolate ganache recipe but added 1 tsp of peppermint extract. I am documenting this recipe for reference as many people may want to refer to it from the macaron group too. Do give this a try. I love the smoothness of the batter and the ease with which it pipes. It is naturally more stable than French method as the egg whites are partially cooked but less scary than Italian method as you don't have to deal with boiling syrup. I will most likely give it a try again but without splitting the egg whites to see if it makes any difference for me but probably not so soon as I am still in the midst of writing my next recipe book on Deco Choux Pastries. For those of you who are interested, the train tracks and grass patch are made from royal icing piped onto a cakeboard. 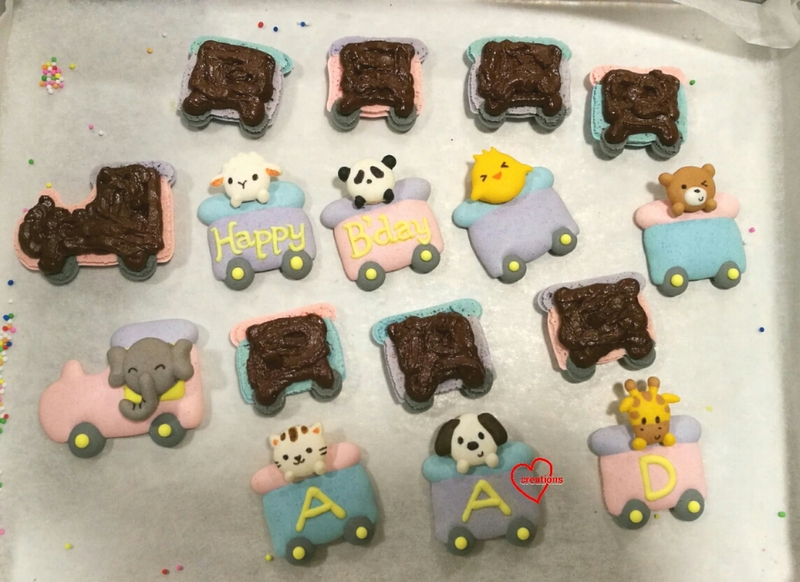 The number "3" is a brown sugar cookie covered in royal icing and rainbow sprinkles. Update 6/2/19: Those of you who are interested in making a reduced-sugar version of the Swiss method, you may have a look at the recipe here. Some macaron characters are easy subjects, such as Hello Kitty and the Tsum Tsum version of Winnie the Pooh. This is an example of what are NOT easy subjects. Presenting two of the Transformers cast -- Optimus Prime and Bumblebee! My friend requested for these as farewell gifts that mark the end of a school year. I thought it would be pretty all right to make just the heads of the characters. 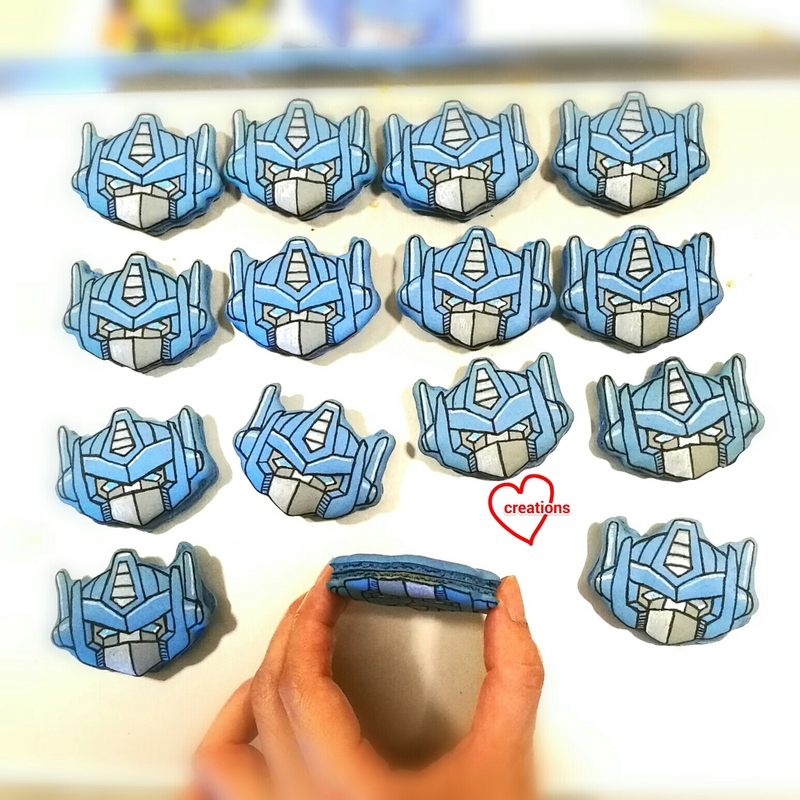 But it was when I started making them that I realised how super tedious the whole process is! As a general rule, the more the shape of a subject deviates from the circle shape, the more tedious it would be to pipe. 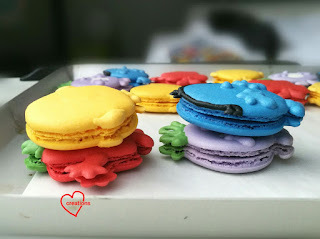 I used the Italian method to make these macarons.You may use your favourite macaron recipe or any recipe in our blog. 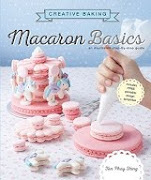 You may refer to my macaron books Creative Baking: Macarons and Creative Baking: Macaron Basics for a more systematic review of the basics and piping techniques, as well as the macaron shell recipe I used here. Adding on the details post-baking was even more tedious than piping the batter. 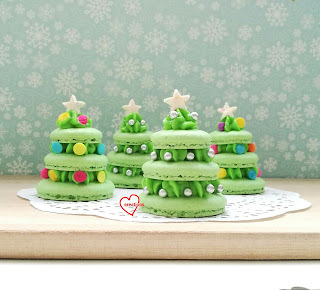 I needed two days to work on decorating 30 macarons. Either that or I am getting old and need to take more eye breaks 😆. 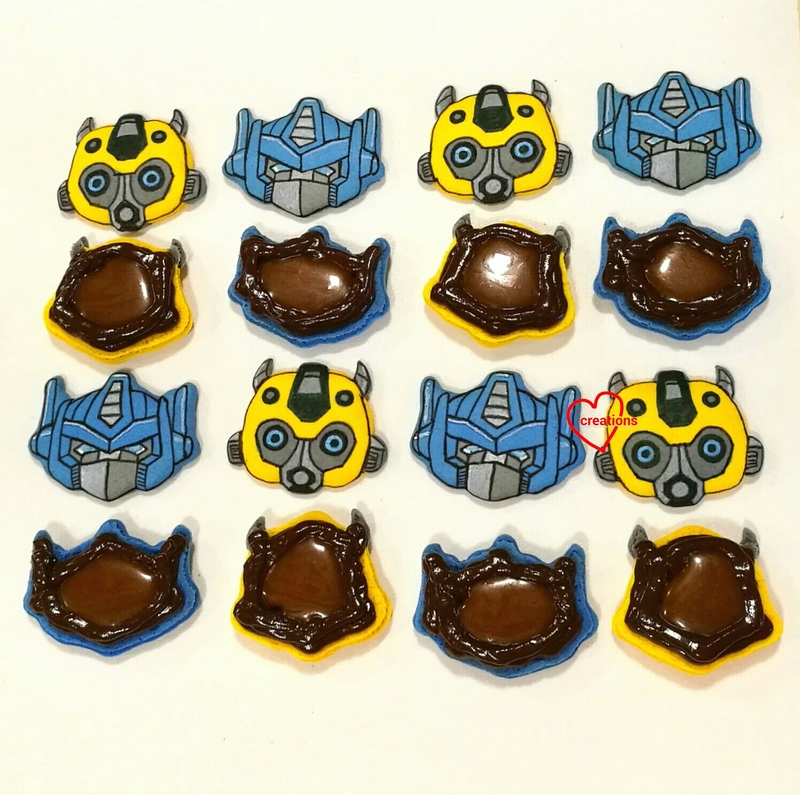 Other than techniques of baking macaron shells, I get queries about how I manage to draw by freehand all the minute details on the macaron shells. I would say having learnt the Chinese language from young is an advantage. We learn how to write by learning the brush strokes (笔画) of each word. Usually by the 5th or 6th piece, I have the "brush strokes" of each character figured out. I can proceed at a quicker pace as I memorised the "brush strokes" to draw. It becomes a calligraphy exercise after a while! 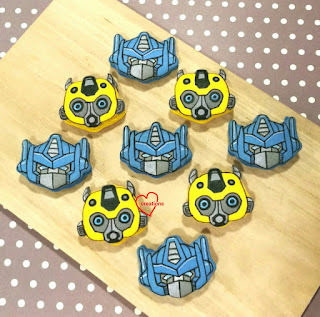 I decorate these Transformer pieces first by using a fairly fine black edible marker to draw the outline or "brush strokes" of the character. Next, I fill in the highlights or coloured portions by painting using a very fine soft brush with edible paint. I make the paint by dissolving gel food colouring in a little vodka. As the shells had to spend some time out in the open for decoration, I oven dried each tray worth of decorated shells at 80℃ for 20 min, and ensure that there is at least three days of maturation allowed post-assembly with filling as the shells will become drier with this additional drying step. 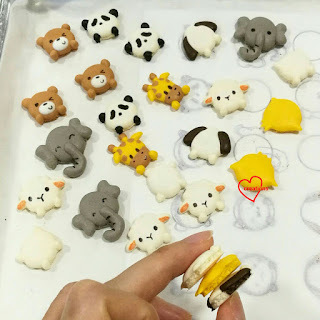 My friend requested for macarons filled with dark chocolate ganache and salted caramel some time back. She really loved the taste so she requested for it again this time round. Filling the shells with an outer ring of dark chocolate ganache and generous dollop of salted caramel in the middle. I packed each pair into little gift bags. Thank God that these were really well received in terms of looks and taste! Super honoured and thankful to be commissioned by Cartoon Network to make a Powerpuff Girls Cake for their 20th Anniversary!! Love those girls who save the world! 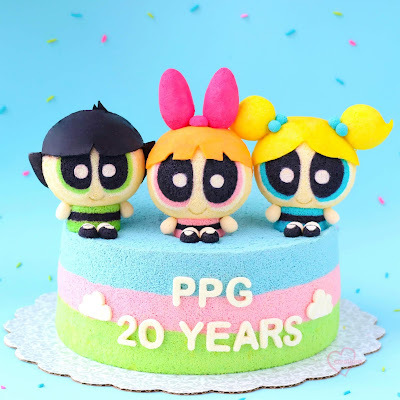 Really thank God the cake was well-received by Cartoon Network! You can see their Instagram and FB posts here. 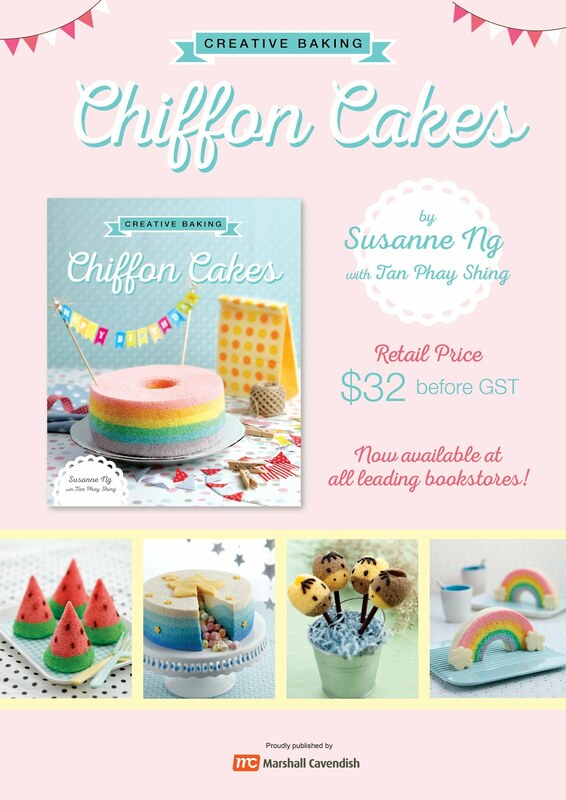 I have shared recipe for Tri-colour Rainbow Chiffon Cake before here. 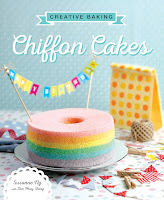 This is a big 10-inch chiffon cake, so the recipe is multiplied by 3. Baking conditions for 10-inch: 15 min at 160°C, 10 min at 150°C and then at 140°C for 1 hr. The Powerpuff girls were the difficult part of the creation because of all the details. 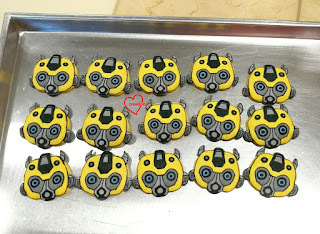 Briefly, the face was made by piping chiffon cake batter in glass bowls, so the features were baked into them (protocol follow Hello kitty chiffon cupcakes). 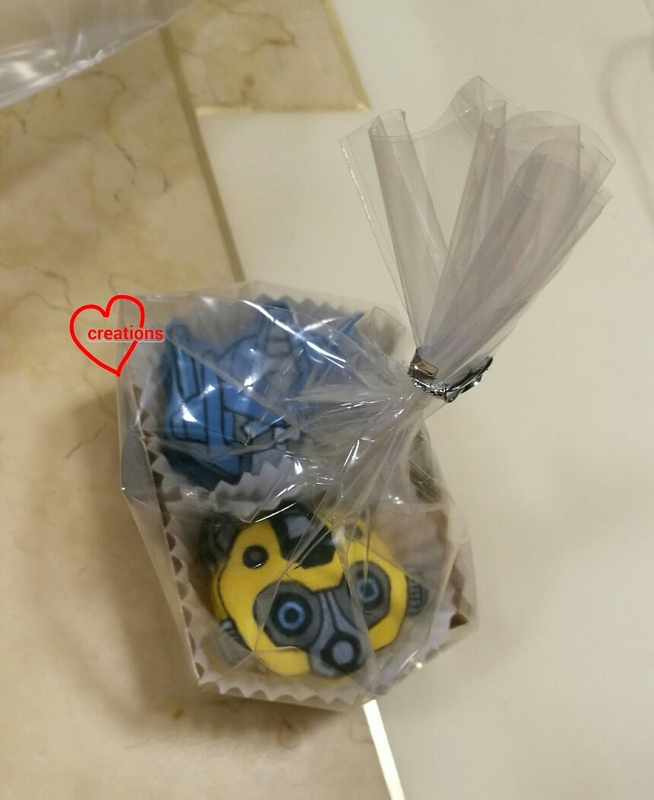 The body was made from baking a mini striped chiffon cake in a cupcake liner. 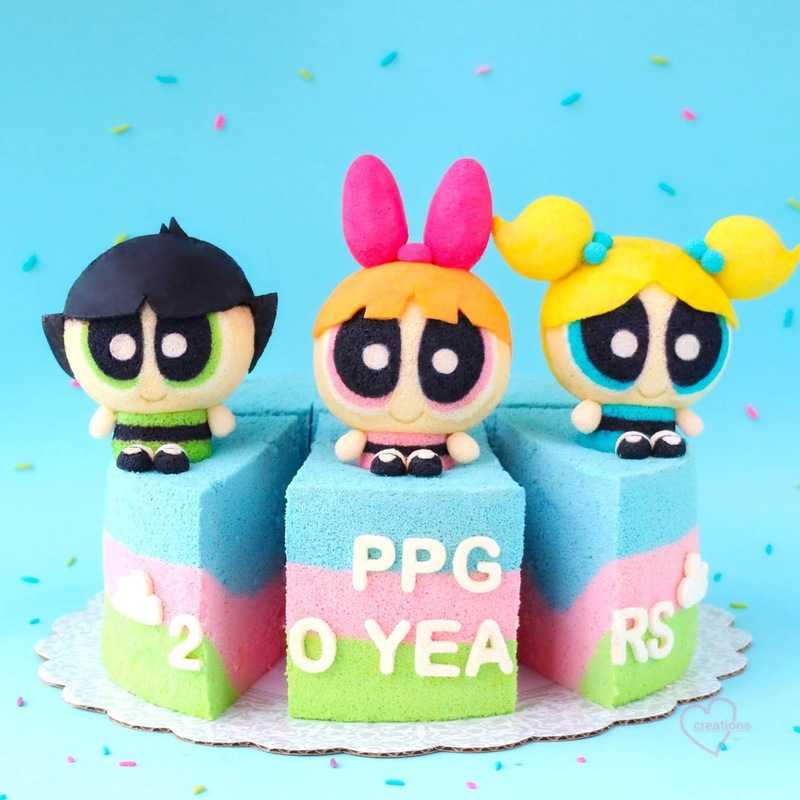 Other details are cut from sheet cakes (eg the hair) and shaped and also cut from cake pops. These were glued on using melted marshmallows. 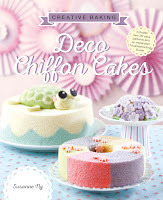 For step-by-step pics of these techniques, you can refer to Deco Chiffon Cake Basics cookbook (book cover below). I think in all I had like 12 bowls of different colours and shades of chiffon cake batter! Here is the shot right after I sliced into the cake =). Very stressful to slice always hehe. Hope you like this labour of love too! My friend requested for several chiffon cake bunnies for her boss' birthday. She sent photos of his adorable pet bunnies for my reference so that I can come up with a chiffon version. Here it is! 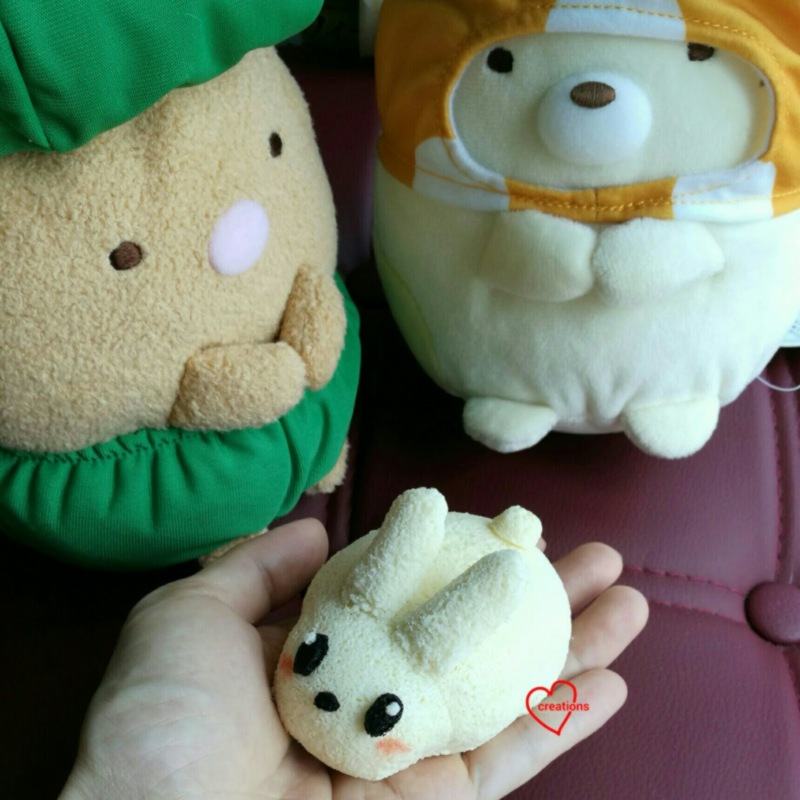 I unintentionally produced the bunny version of We Bare Bears 😆! 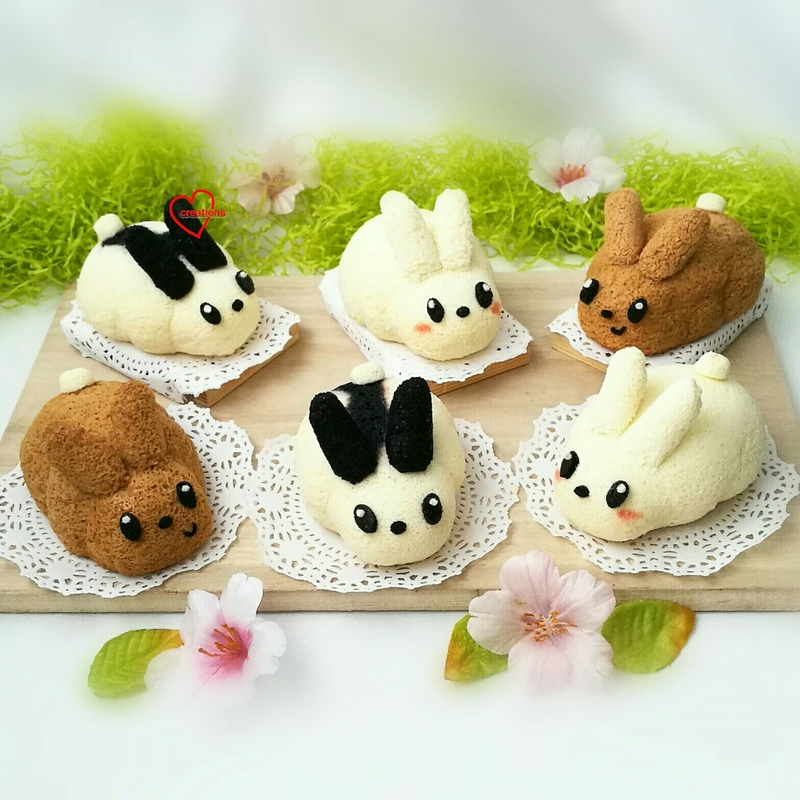 I made a total of 10 bunnies but only six are on display here. The brown ones are coconut Gula melaka flavoured. The white and panda patterned ones are yuzu flavoured. 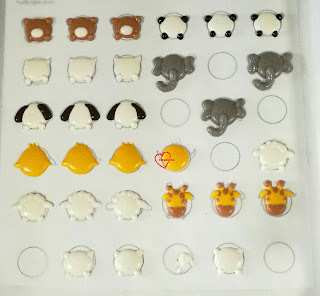 Although I contemplated baking the bunny bodies in eggshells, I decided to use silicone moulds instead because I prefer the cakes to be a little larger. I bought the Silikomart half oval mould. You may use eggshells to bake these if you don't want to buy the mould. Make a hole at the side and not the pointy end of the egg if you are using eggshells for these. Make sure you wash the egg shell thoroughly after removing the membrane inside the eggshell and dry it before use. I used the recipe from here for the yuzu flavoured cakes. I will type out the recipe I used for the coconut Gula Melaka bunnies here as I didn't use cooked dough method like I did for my past few coconut Gula Melaka cakes and increased the amount of coconut palm sugar used for a stronger Gula Melaka flavour. 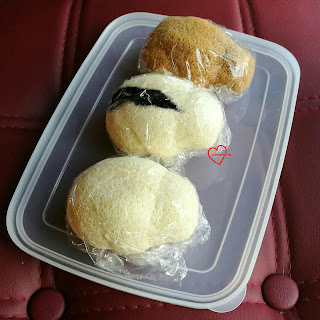 I used the powdered form of Gula melaka (coconut palm sugar) for making chiffon cakes but you may also finely chop from a block if you are unable to find the powdered or granulated version. 1. Line baking tray for baking sheet cake with parchment paper. 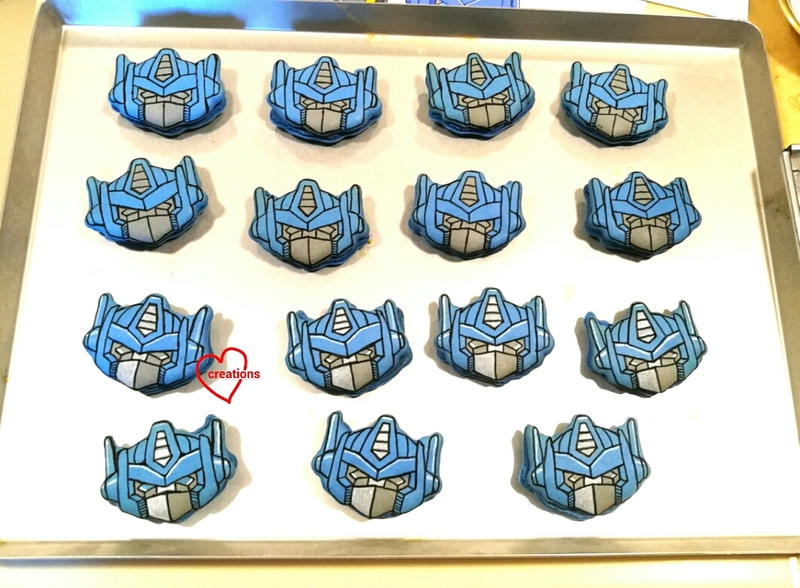 Preheat oven to 160℃. Place a tray of water at base of oven (optional) to create steam. Set oven rack to second lowest position. 2. Prepare egg yolk batter. Whisk egg yolks with Gula melaka until thick and pale. Add oil and whisk until well combined. Add coconut milk, vanilla and salt until well combined. Gradually sift in cake flour and whisk until no trace of flour is seen. 3. Make the meringue. 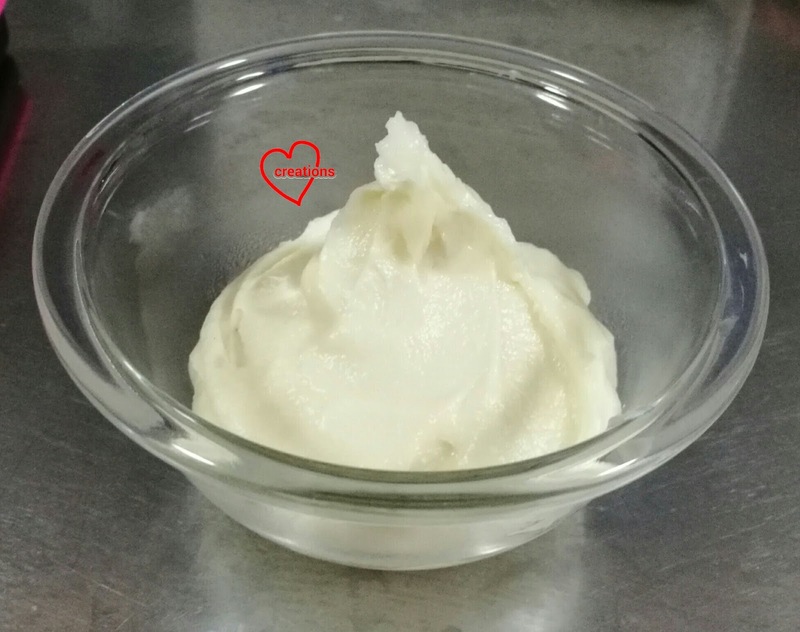 In a clean metal bowl, bear egg whites with cream of tartar until firm peaks form or stiff peaks just reached, gradually adding in the sugars knce the egg whites are foamy. You may mix the caster sugar and Gula melaka together before adding to egg whites. 4. Quickly but gently fold the meringue into the egg yolk batter in three batches until no trace of meringue is seen. 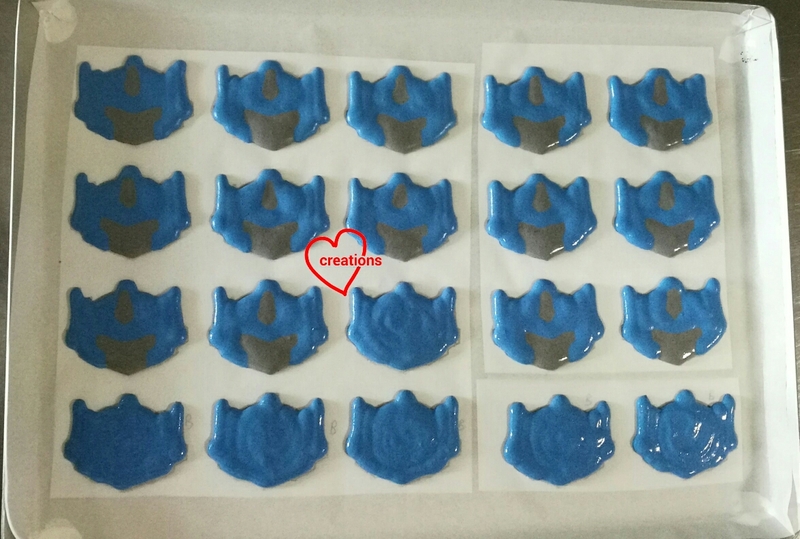 Spoon the batter into the moulds/cupcake cases. Gently tap on table to release trapped air. 5. 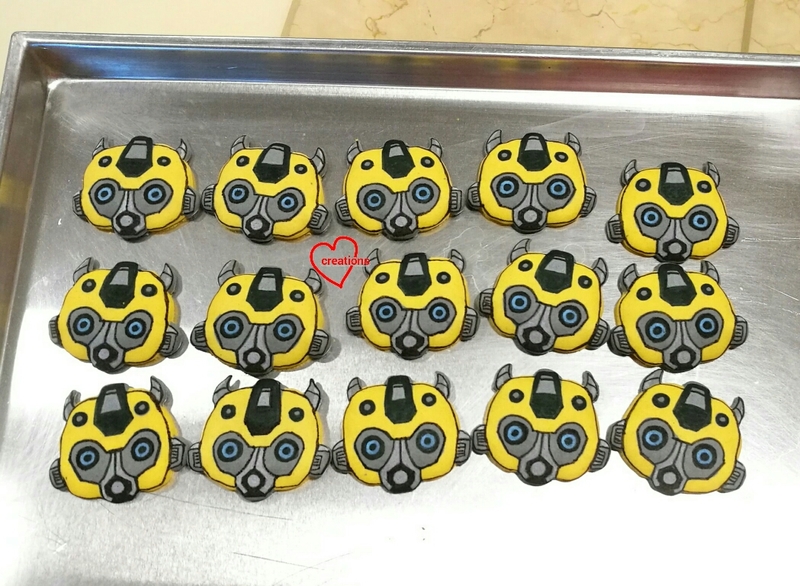 Bake for 5 minutes and reduce temperature to 140℃ and bake for another 7-8 min for the sheet cake but another 15min for the cupcakes/mini cakes. Immediately flip the sheet cake onto another parchment paper and cool it in a rolled up position like Swiss roll. 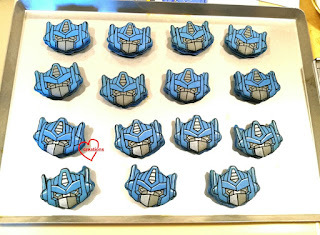 Continue baking the cupcakes at 125℃ for another 10-20 minutes or until cake bounces back when lightly pressed. Do note that baking time will depend on size of cake and individual ovens. 6. Cool completely in the moulds before unmoulding by hand. I have a unique way of shaping the cakes that doesn't involve careful and tedious carving with a small knife. After unmoulding the cakes by hand, I wrap each cake up with cling wrap. I used scotch tape to tape around where the head is supposed to end (I wouldn't call that the neck here because it doesn't look like one hehe). Imagine giving the bunny a collar. That's where the tape should go. I used a round cookie cutter of an appropriate size to create an indent on each side of the bunny to create an impression of bunched up hind legs. Simply press the cookie cutter to the side of the cake for a minute or so while cupping the cake in your hand. Remove the scotch tape around the head after several minutes. Repeat making the indent on the sides of the bunny if you find that the cake bounces back too much for it to be visible. Ta-dah! Bunny bodies made without complicated carving! 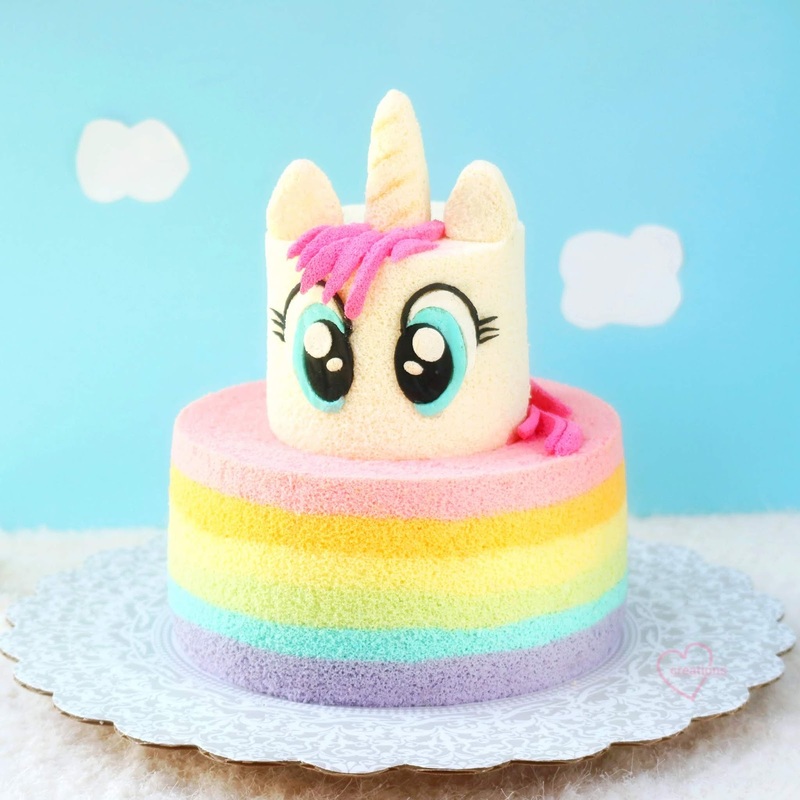 The ears, tail and facial features were made from sheet cakes. The ears are rolled up like Swiss roll. 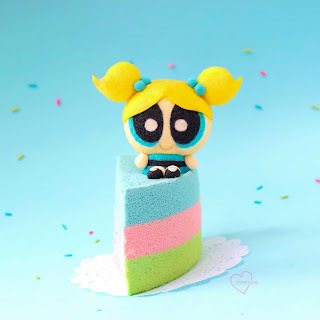 It helps to bake very thin layers of cakes for the ears and facial features. Although I used melted marshmellows to stick on the parts, I reinforced the ears with toothpicks. You may use sticks of pasta or omit the toothpicks. Using melted marshmellows to glue on the eyes. Only to be reunited to be "killed" and watch his friends get massacred too 😆. 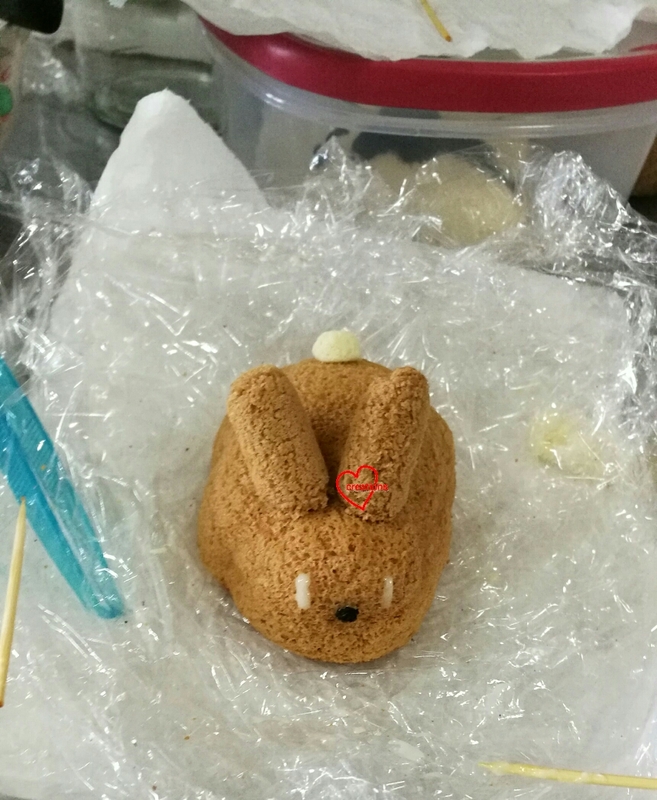 Glad that my friend and her colleagues enjoyed eating the bunnies! My younger kid loves reading Mr Men and Little Miss books when we park ourselves at Kinokuniya although he reads longer novels at home. 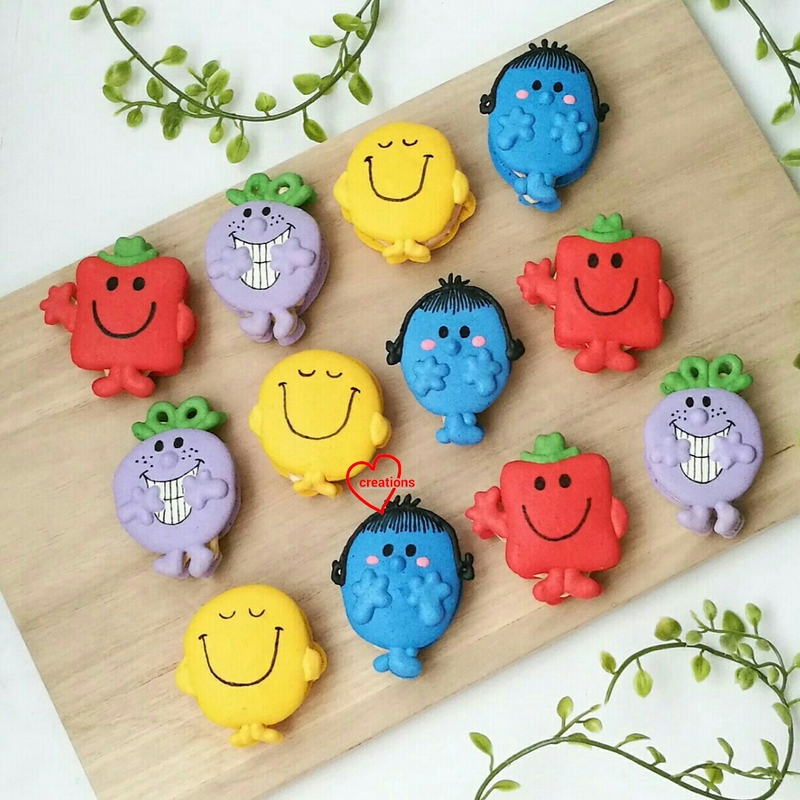 These whimsical characters have a sort of charm that he can't resist! 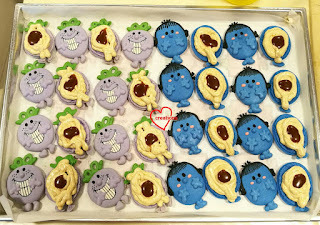 That is why I made characters of his choice for his birthday to share with his classmates. Mr Strong, Mr Happy, Little Miss Shy and Little Miss Naughty! I made these during a really busy period when it was more convenient to break a long complex bake into a few shorter, more manageable bakes. 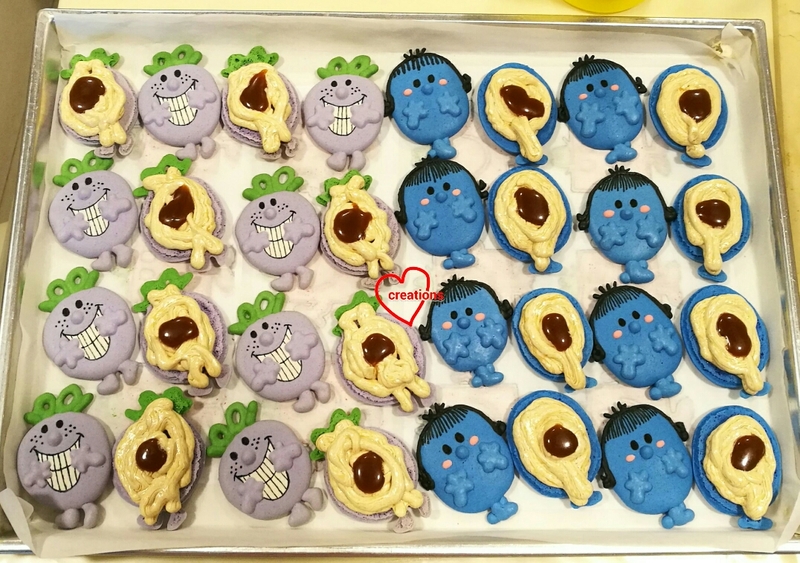 These characters were baked over three separate days, decorated one day, and filled and packed on another day. 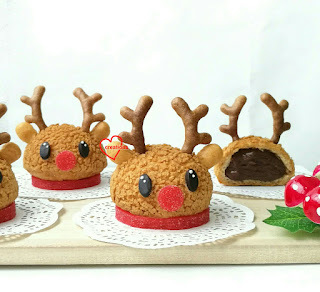 That was why I used my stabilized French method recipe for the characters. 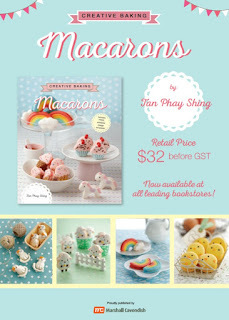 You may refer to either of my macaron books for piping and baking tips -- Creative Baking: Macarons and Creative Baking: Macaron Basics. I must admit that piping the hands with those little fingers was a challenge. I decorated the macaron shells with black edible marker and a little pink royal icing for Little Miss Shy's rosy cheeks. What I really want to share in this post is another ermine buttercream recipe that is stable at Singapore's tropical climate and it's not too sweet. The kids love it! That's the feedback I got from my kid. I decided on salted caramel as the flavour as it's more exciting than vanilla but not as heaty as dark chocolate (some kids can't take chocolate well) and not all kids like fruity flavours like strawberry. 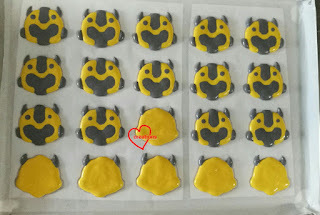 I used ermine buttercream as the filling base for my Children's Day bake this year, which was also very well received by both my kids' classes. 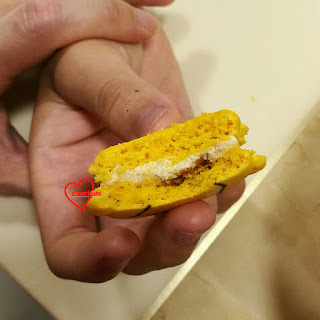 What I did differently this time is to use cream cheese as well to add that extra tangy dimension to the filling. Cream cheese is also rather firm so it's a good base to use. For your convenience I will post the salted caramel recipe here as well. 1. Place sugar and water in a light coloured heavy base saucepan. Light coloured because it is easier to see the colour of the caramel. Heat over medium heat without stirring. Swirl the saucepan to help the sugar dissolve. 2. In the meantime, heat cream in another small saucepan until it just starts to bubble. 3. Monitor the sugar syrup as it boils, swirling the pan now and then to distribute the heat evenly. Once the colour of the syrup changes to light amber colour, keep a close watch. 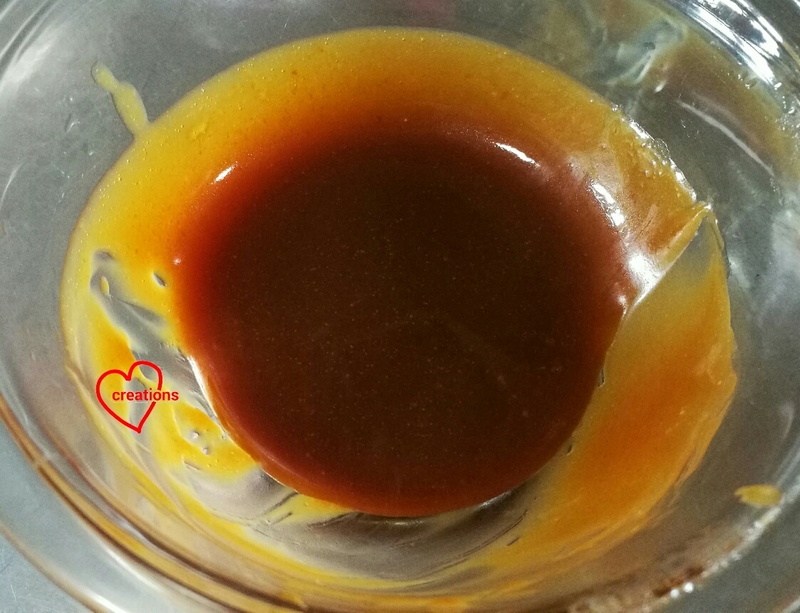 You want the caramel to have a deep flavour without being burnt. Once the colour is a deep amber colour, remove from heat and pour a little warm cream in and then stir quickly with a long wooden spoon. The mixture will bubble violently so be careful. Continue gradually pouring the cream and stirring the mixture until the bubbling stops. 4. Add butter and mix well. Add salt and vanilla until well combined. Transfer to a container or bowl and let it cool before using or storing. Salted caramel cam be kept frozen for several months or in the fridge for a month. I switch to using a spatula to cook the roux once it gets really thick, removing the saucepan from heat now and then so that I can cook the roux more evenly, making sure I scrape the sides and bottom of the pan. Transfer the roux into a bowl and press cling wrap on the surface. Chill in fridge for at least half an hour. You may prepare this the day before. 3. Add the roux one tablespoon at a time, beating well with electric mixer after each addition until well combined. 4. Add vanilla if you wish. Continue beating for a couple more minutes until smooth. Salted caramel cream cheese ermine buttercream! To assemble the macarons, fill one piping bag with the ermine buttercream and another bag with salted caramel. Piping a ring of buttercream on the bottom shell and pipe a dollop of salted caramel in the middle. Glad that it was really well received! Here's a peek at the insides. Pardon the lack of oozing salted caramel. I was close to running out of caramel towards the end and didn't want to make another batch just to fill a few more extra macarons that my kids had. Nonetheless, it's still yummy! "C is for Cookie Monster!" 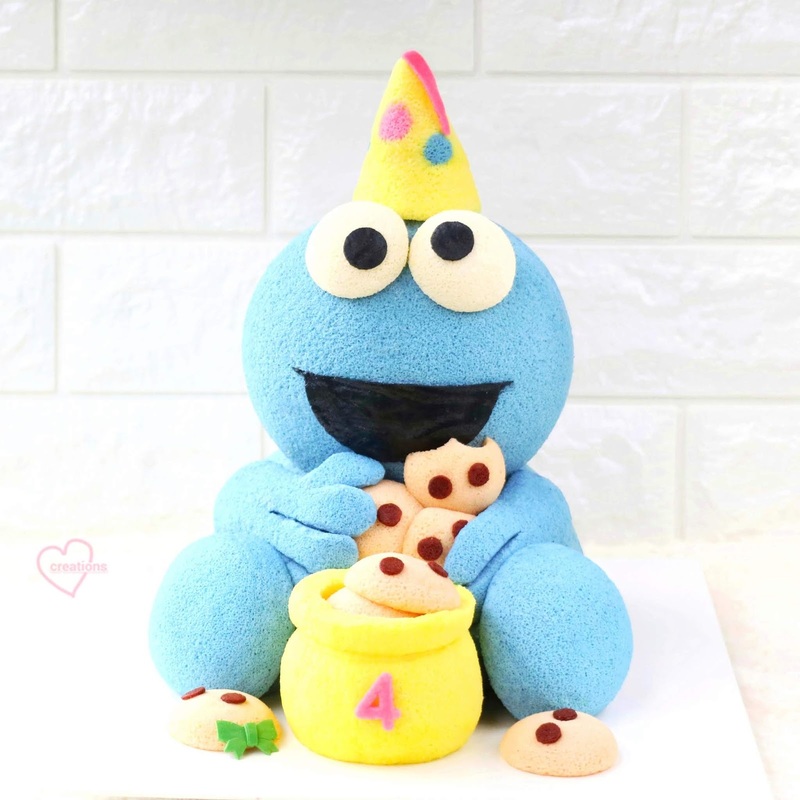 Cookie Monster made entirely from Chiffon Cake! Another very challenging cake, thank God it worked out! The arms and hands were particularly difficult as it was entirely carved from chiffon cake. The hat was also fun! 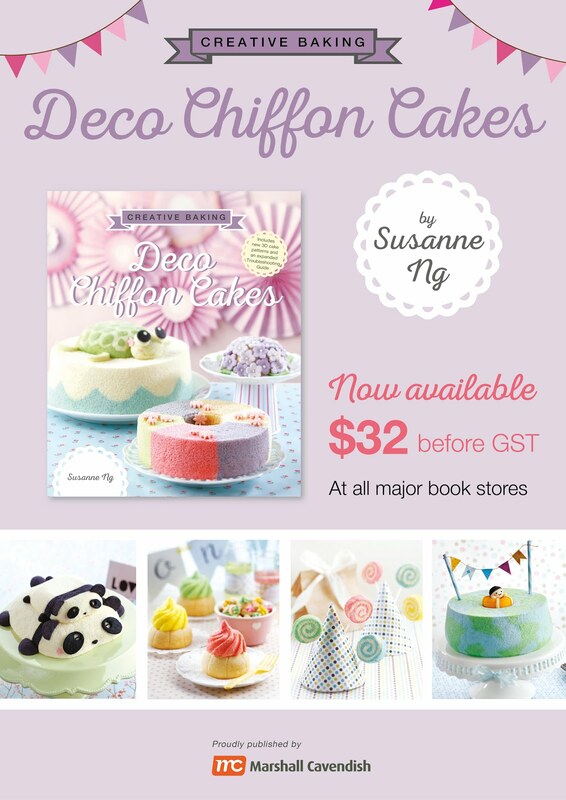 I piped polka dots in the paper cone and baked chiffon cake in it. A bit busy on the family front, especially with kids, so posting a little less (sorry about it). Been really tired... but thank God for sustaining us daily.